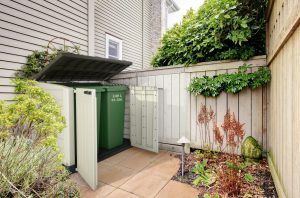 Modern kit-form Bin Cover - Ugly wheelie bins concealed! When its time for the bin run do you grimace at what you see? Does the inner house-proud in you feel not so house-proud? Meet the Store-It-Out Max. 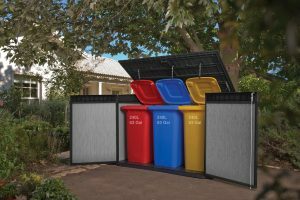 Fits 2 full size 240L wheelie bins. Bin opening kit included. Every time you lift the Storage Unit lid, hey, pronto, the bin lid opens too! Front doors open with a sloped threshold to easily wheel bins in and out. Bins concealed! 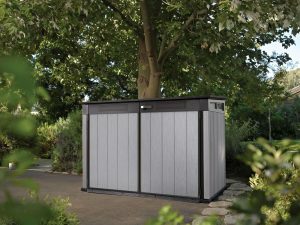 Does your local council have 2 large and 1 small bin? The Store-It-Out Ultra can help. Get yours now and get those bins out of sight! 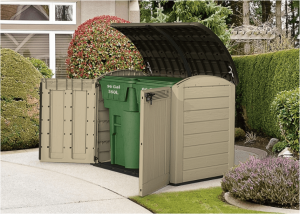 If you have 3 full size bins they will fit in the Grande Store, our smartest looking bin cover! This storage unit is made with cutting edge DUOTECH technology, you can paint the walls any colour you desire. However, if you like the grey, you’re most welcome to keep it that way! The Grande Store can hide all 3 full size bins for you, yet, still so easy to get to and put your rubbish away. Order now, free freight to most of Australia.